I’ve been working for a over a year and a half on the perfect chocolate chip cookie recipe for my family. It had to be gluten free and vegan, but it needed to be a great cookie, regardless. We tried overpriced, store bought versions that tasted like cardboard and usually weren’t vegan. We tried overpriced, bakery cookies that were a little better, but still way too hard, definitely not the soft and chewy cookie we craved. I finally decided if we were ever going to have a really tasty, really decadent, really comforting, really soft, chocolate chip cookie again, it was going to come out of my oven. So I started experimenting. We went through a lot of cookies, mostly good, but never great, and then I got bored, and a bit frustrated, with the process. I thought we would have to settle for a cookie that was “a little off”. It was just one of the consequences we were destined to suffer for demanding a cookie that was both gluten free and vegan. Beggars can’t be choosers, right? This past week, after setting the recipe aside for several months, the baking bug bit me, and I decided to give my chocolate chip cookie recipe a whirl again. Ok. It wasn’t the baking bug. It was the fact that our apartment has been freezing with the recent cold weather and my husband insisted I bake something to warm it up. He apparently didn’t view my wearing long johns under my clothes and a hat indoors reasonable any longer. 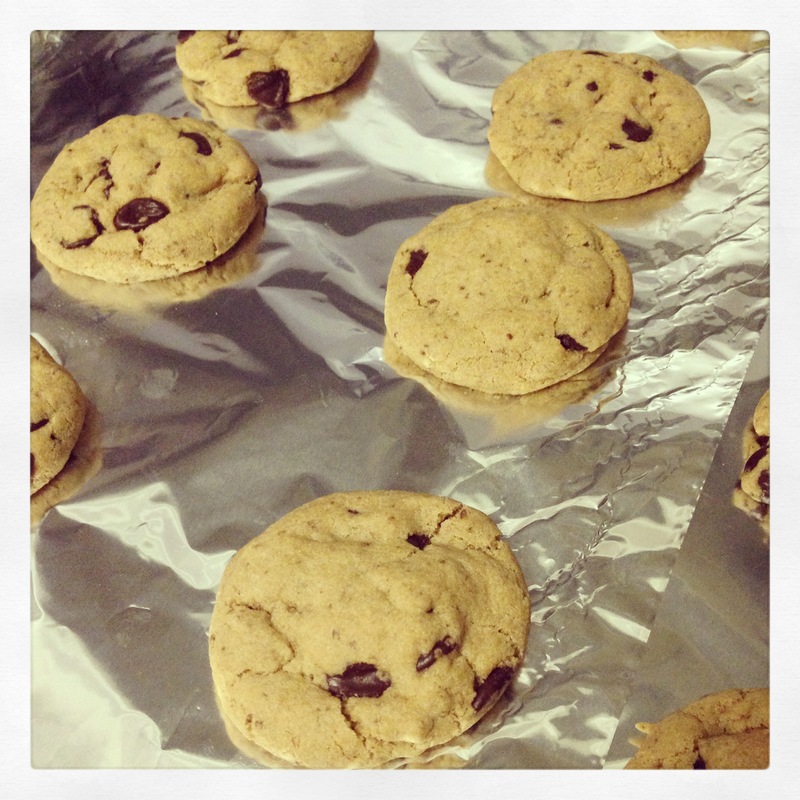 Aside from that nonsense, I was PMS’ing, so why wouldn’t I want to bake some chocolate-laden cookies? Ah, the cookies at Levain Bakery. 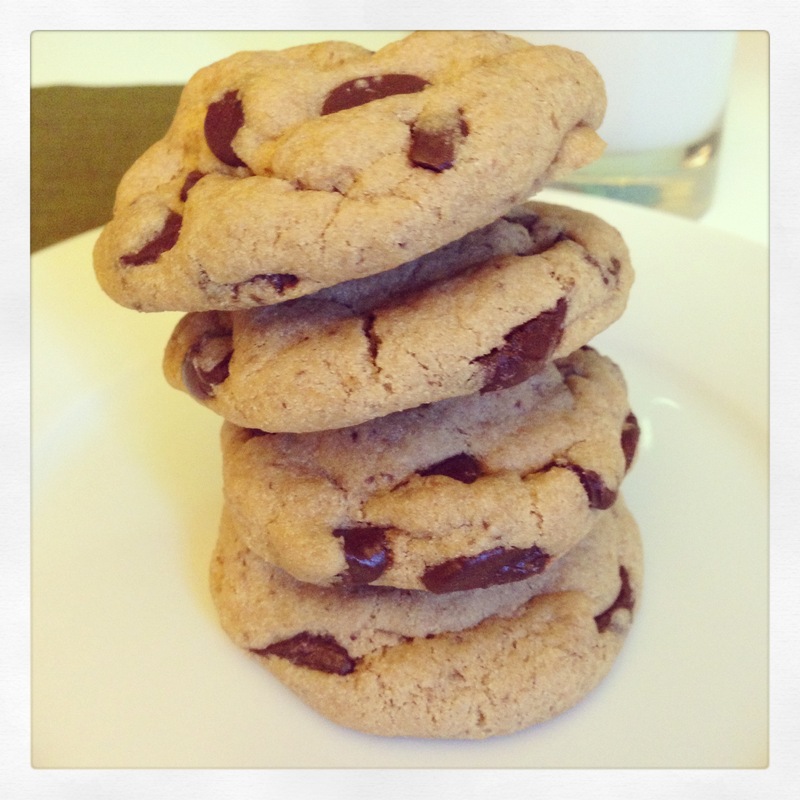 Widely regarded as the best chocolate chip cookies in NYC, maybe anywhere. Winners of the famed (in Food Network circles) Throwdown with Bobby Flay. Oh, I know you cookies, but because you are gluten full, I only know you through the wide eyes and moans of appreciation I witness each time I bring an out-of-town guest across the bakery threshold to determine for themselves if the legend lives up to the hype. No one has ever been disappointed, except for me. So with the ringing endorsement that the Levain Bakery chocolate chip cookie was only chocolate chip cookie possibly better than this one, I knew my quest had ended. I’m ok with letting Levain Bakery keep the chocolate chip cookie crown. I mean, one of those puppies will set you back $4.00. For that price, it should be special. To begin, prepare flax eggs in a small bowl and place in refrigerator to set. Next preheat oven to 350 degrees. Prepare baking sheets by lining with parchment paper. In the bowl of a stand mixer, add Earth’s Balance and coconut oil. Combine on medium/medium high speed for 2-3 minutes, periodically scraping sides of bowl. Next, add sugars and continue mixing for another 5 minutes or so. You want the mixture to be creamy white, with the sugars mostly dissolved, and significantly thicker and fluffier than when you started. It should start to look like whipped cream, but a bit denser. Meanwhile, in a medium bowl, measure and combine the dry ingredients (flour, baking soda and salt). Add the vanilla and flax eggs to the oil/sugar mixture and blend until combined, another minute or so. Incorporate the mixture of dry ingredients and mix at low to medium speed until well combined. Stir in the chocolate chips. Roll tablespoons of dough into balls and place on prepared baking sheets. Bake at 350 degrees for 8-10 minutes. A note on the flour: I cannot guarantee the outcome of these cookies if you do not use the Namaste flour recommended above. I tried several different flours and flour blends before settling on this option. It’s a great flour. According to my husband, “you haven’t made anything bad since you started using it.” I purchase mine online by the case through Amazon. You can check out other sourcing options here.